While places like New Jersey, who the New York Daily News recently reported, have passed a bill requiring schools to teach acceptable use of social media, cyber safety, cyber security, ethics, and cyberbullying, the NYC Department of Education goes even further. As evidenced in their newly released student social media guidelines, they recognize the importance of social media beyond just using social media responsibly. 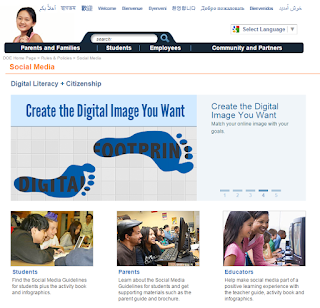 They understand that students can embrace social media for social good, as a way to celebrate our stories, as a tool to create a positive online identity leading to college and career success, and as a way to build powerful learning networks. This has not only been good for NYC DOE students and staff, but it's also been a relief to the Department's legal office as reported in DNAinfo. “We were getting so many complaints from parents: ‘My kid somehow accessed a teacher on Facebook and saw a picture of them on the beach with a beer,’” said Courtenaye Jackson-Chase, general counsel for the DOE. “[Teachers] weren’t expecting their students to see their pictures of family and friends. Principals were calling my office daily, saying, ‘We welcome social media but we’re scared.’”The social media guidelines for educators have been effective, Jackson-Chase said. And the NYC DOE didn't just release the guidelines, post them on the internet and expect positive change. As veteran educator and new Chancellor Carmen Fariña has emphasized, if we want to see teachers succeed, we must support teachers with adequate professional development. As Pook shared with Huff Post Parents, "the guidelines will be supplemented with professional development training for teachers, parents and parent coordinators, informing them how to bring these standards into the classroom and home." Organizations like Social Assurity which provides social media investigation, counseling, management, and monitoring services for parents, teens, and college students are taking note, giving high praise to the guidelines for producing such a stellar work product. Likewise, Net Family News which provides technology intelligence for parentsgave the NYC DOE high praise for working with students to create guidelines rather than putting out a policy based on fear. As the largest school district in the United States, the NYC DOE has the unique ability to pave the way for other schools and districts to follow suit. The media is taking notice and sharing this work as well. This also is in alignment with Chancellor Fariña's promise to emphasize "Celebration." Reversing the trend stories about how bad teachers are. This is a shift. The media is recognizing that educators want to make a difference in the lives of students, and social media is a effective tool to help them do so. You can see the story on ABC Eyewitness News below. If you are in a school or district where you want to influence change, show them what the NYC DOE is doing as inspiration to get started where you work. Now that the NYC DOE has paved the way, the only question left to ask, is: "Who's next?"